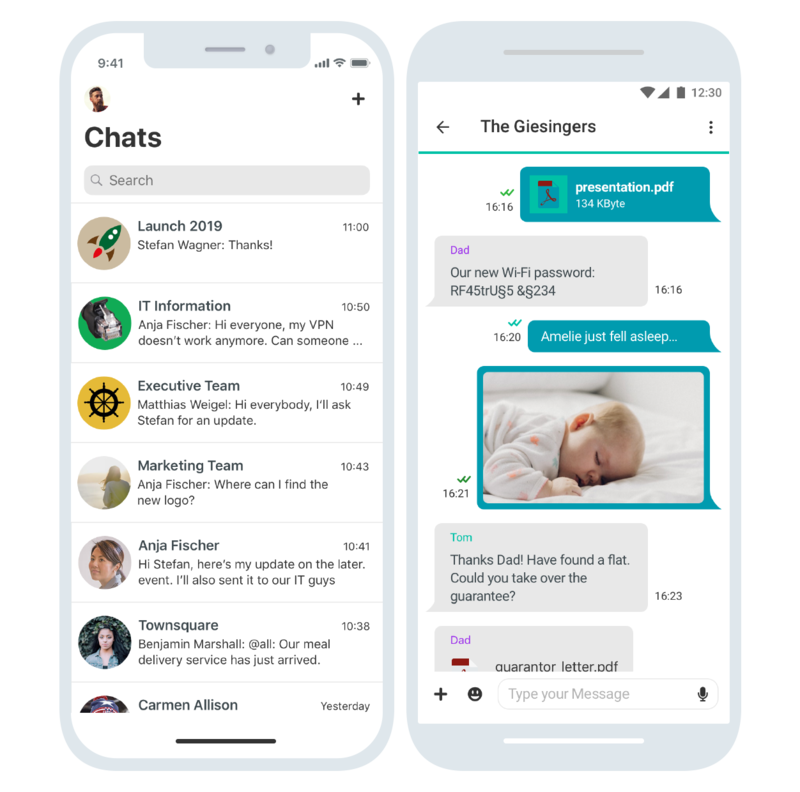 ginlo, the messenger for private and confidential communication. Your WhatsApp alternative. Intuitive to use, without prior knowledge or technical know-how. We encrypt all your data with the strongest algorithms. Not just during transport (end-to-end), but also on the local devices. And thanks to this full encryption, we as the provider have no access at all. Based in Munich, we offer you high-quality products for digital communication. Your encrypted data is exclusively hosted on German servers. As a company, you gain full key and data sovereignty for your teams. Protect your digital communication from third parties, while you retain access at all times. We act under German legislation and comply with the requirements of the GDPR (General Data Protection Regulation). ginlo isn’t another ad-based service. We rely on a traditional business model that ensures the privacy of your data through a small monthly contribution. We at ginlo aren’t like those abstract corporations that are located everywhere and nowhere. We’re an authentic Munich company with an international team of 23 nationalities. Available for you at any time. Deutsche Post has trustingly handed over their messenger SIMSme (Business and Private) to us and supports Brabbler AG as a shareholder with its expertise. We’re excited about combining the best of both product worlds and using synergies to further develop digital communication solutions without side effects "made in Germany". Renk AG, a supplier of drive technology, now uses Brabbler AG’s business messenger “ginlo @work” for internal communication on desktop PCs and mobile devices. WhatsApp can be found on the business smartphone of almost every second employee in Germany – although almost half of these users are aware of the privacy risks for their employer. Brabbler AG considers the announced advertisements on WhatsApp as yet another wake-up call for users. Supposedly ad-free communication services can’t be trusted. For this and other news and press clippings about ginlo and Brabbler AG, please visit our pressroom. In the age of digital interconnectivity, data has become a new currency. Private users pay with their privacy for the “free” apps of US-based corporations. Companies, on the other hand, are a constant target of cyber attacks and industrial espionage. All this makes it more important than ever to regain control over sensitive personal and business data. That’s why it is our heartfelt goal to make online privacy and confidentiality come true. We, the founders of GMX, have started up Brabbler AG together with dedicated Internet visionaries and software specialists. With ginlo, we want to provide a real alternative. A secure communication platform at a fair price. For you, for our families and friends, for companies, for everyone. Would you like to be part of the Brabbler Team? Here you can find our job vacancies.